“We’re excited to deepen our relationship with [Fiat Chrysler] that will support the launch of our driverless service,” said Waymo’s chief executive, John Krafcik. NEW YORK — Waymo, the driverless-technology company spun out of Google, has agreed to purchase as many as 62,000 minivans from Fiat Chrysler Automobiles for use in a ride-hailing service set to begin commercial operations later this year. The announcement Thursday is the latest sign that Waymo is counting on a rapid liftoff for the service. In March, it agreed to purchase up to 20,000 compact cars for the service from Jaguar Land Rover beginning in 2019. Both the Chrysler Pacifica minivans and the Jaguar cars will be equipped with the radars, cameras, and sensors that Waymo has developed to enable the vehicles to drive themselves on public roads. Waymo plans to start its service in Phoenix, then expand to the San Francisco area and to other cities across the country. 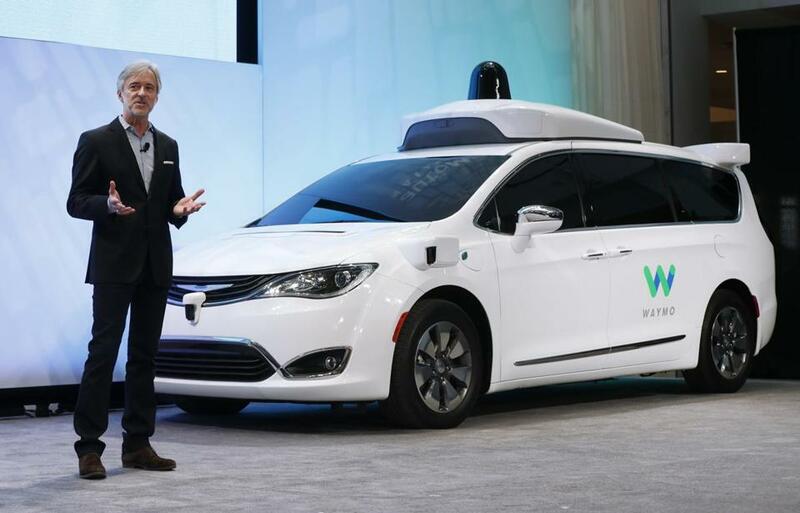 Waymo began working with Fiat Chrysler in 2016 and has built a fleet of driverless minivans that it has been testing in Phoenix; Mountain View, Calif.; Austin, Texas, and Kirkland, Wash.
“We’re excited to deepen our relationship with F.C.A. that will support the launch of our driverless service, and explore future products that support Waymo’s mission,” Waymo’s chief executive, John Krafcik, said in a statement. Waymo, a unit of Google’s parent company, Alphabet, will begin purchasing the minivans late this year. It gave no details on how many minivans it expects to purchase this year or next, or what period the purchase agreement covers. The company has been working on self-driving technology for nearly a decade and is focusing on four potential lines of business. In addition to the ride service it intends to start, Waymo also expects to put its autonomous-driving technology into trucks and delivery vehicles. It is also developing systems for buses or other vehicles that can ferry riders to mass transportation systems. The fourth area would involve licensing its technology to automakers like Fiat Chrysler. In March, Krafcik said these four areas have to potential to become highly profitable businesses. Waymo does not intend to make cars itself. The companies said Thursday that they were in talks about licensing Waymo technology to Fiat Chrysler so the carmaker can at some point sell self-driving minivans to consumers. The Waymo announcement came hours after General Motors revealed its self-driving car operations would be getting a $2.25 billion investment from a fund affiliated with Japan’s SoftBank Group. The new capital is intended to help the automaker’s Cruise division start a commercial ride service that will also use self-driving cars.